Congressional negotiators announced on Monday night they have a border wall funding agreement they believe President Trump will sign into law. The agreement was announced by a group of lawmakers led by Republican Sen. Richard Shelby and Democratic Rep. Nita Lowey, after a closed-door meeting on Capitol Hill. "DO NOT VOTE ON OR FOR THE BUDGET DEAL BILL until lawmakers, the media, and American public have had plenty of time to read or react to the contents of the legislation! 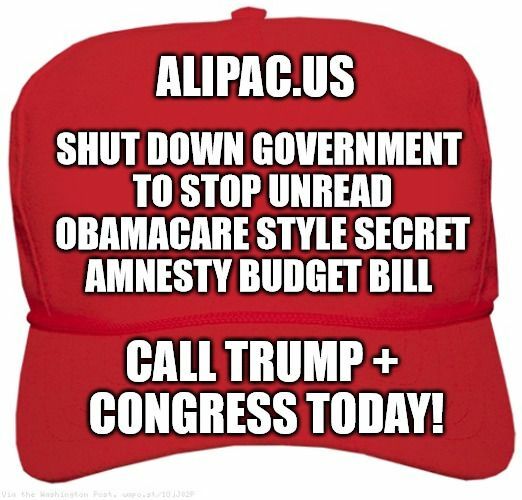 Pass a continuing resolution or shut down the government to allow everyone time to read what is in the secret budget deal bill. If Congress votes blind on this budget bill today like they did on Obamacare, your actions will have a catastrophic effect on the confidence of Americans who are being taxed, yet deprived of representation by such despicable elitist tactics." Call as many DC offices as possible. Contact info at this link. You should also search for these lawmakers on Twitter and Facebook and post your messages to them there too! Is this Chief Justice John Roberts’ poison pill for Obamacare?